The digital footprint of an automotive business has evolved to fulfil many business functions. Today, Automotive Franchises are utilising multiple digital platforms to execute their business strategy, from operational applications that organise and manage the business to marketing plasforms that acquire new business. It is now common for Dealerships to have multiple websites as well as access to brand and portal websites that help manage and market their inventory. Adding to this complexity is the dynamic nature of the internet. New trends, evolving best practices and new platforms are constantly emerging. This fluidity is what makes your digital footprint both interesting but challenging to manage. The best way to manage and understand your digital footprint is through Digital Analytics. One of the internet’s many advantages is that it is constantly collecting data - data that can tell you the where, when, why and what about your potential customers. With a bit of knowledge and effort, you can use this data to enhance your business strategy. All industries have annual and monthly trends which are driven by seasonality, the competition and marketing activity. The most recent Modix Case Study* aggregated traffic across multiple franchise dealer websites in 2015 and 2016. This showed that late spring and late summer are popular times to search for a vehicle. 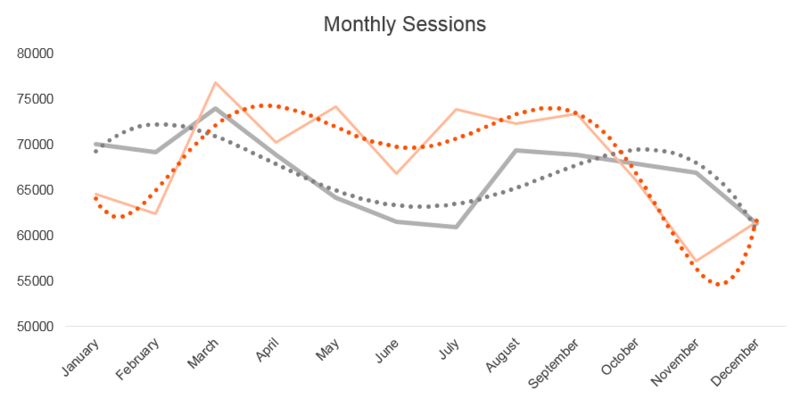 There is a drop in website traffic in the middle of summer as well as towards the end of the year - which is seasonality we all expect. While some years may have variations, most industries have regular annual trends with consistent periods of high and low activity. Knowing the cyclical patterns of the automotive industry can help you interpret the digital performance of your own website. Observing a drop in traffic during June makes more sense when you understand that this is part of the normal pattern of automotive industry trends. This knowledge can also help you make better business decisions. Maybe you want to invest in more digital advertising during the periods of low activity to minimise your own reduction in traffic. Or maybe you want to invest more in digital advertising during March, August and September when your potential customers are actively looking for their next vehicle. Along with annual trends, there are also weekly trends to consider. The most recent Modix Case Study* revealed that people looking for their next car tend to visit the dealership website on Mondays. As the week progresses, so does the activity level. Saturday and Sunday have the lowest percentage of traffic for the week. This suggests that your potential customers are doing their research during the week, probably to prepare for a visit to the dealership on Saturday. Because potential customers are most likely to be on your website on Mondays and Tuesdays, it is very important to have your online stock up-to-date. It is also important to note that activity peaks on Sunday, so your business is still running even when you might not be open. Applying Digital Analytics to your business may seem to be a daunting task at first. But the good news is that there are a number of ways to get started, and a lot of information available if you know where to look. Your digital partners are a great resource to help you analyse and utilise the data specific to your business. The more you start using your data, the easier it becomes. So start asking questions and working with your providers to understand your digital presence and maximise your business’s potential. *Internal Modix Case Study across 10 Franchise Dealerships. 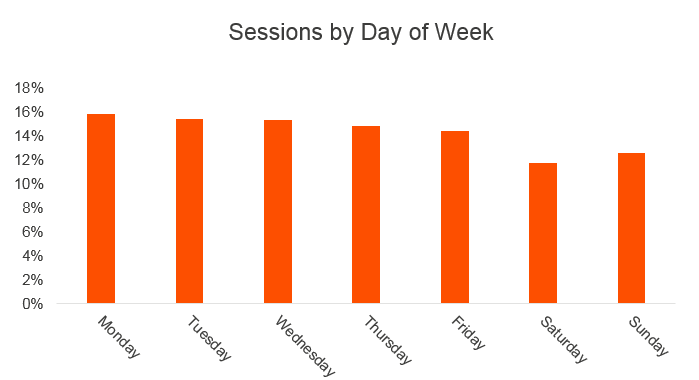 Data Source: Google Analytics. Time Period: 2015 & 2016.